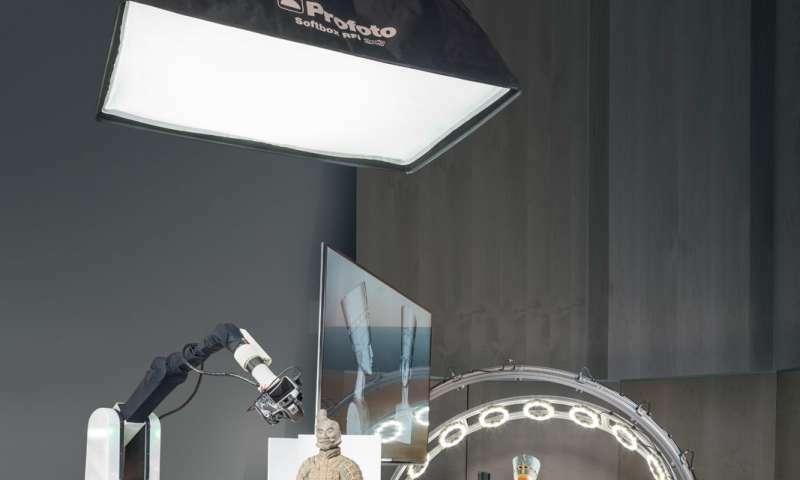 A total of 16 Fraunhofer Institutes are collaborating on the cultural heritage research project, together with their partners, the Dresden State Art Collections and the Saxon State and University Library Dresden (SLUB). The Fraunhofer executive board is supporting the project with €1.5 million in funding. "That makes it one of the largest German research projects in the field of cultural heritage," says Dr. Johanna Leissner, the Brussels-based coordinator of the executive board project and spokeswoman for the Research Alliance Cultural Heritage. The project results were presented this past September at the closing event in Dresden – as a contribution by the Fraunhofer-Gesellschaft to the European Year of Cultural Heritage. Special software processes these images to generate the three-dimensional digital replica. This method also works with large statues, although it must then be performed manually rather than automatically. 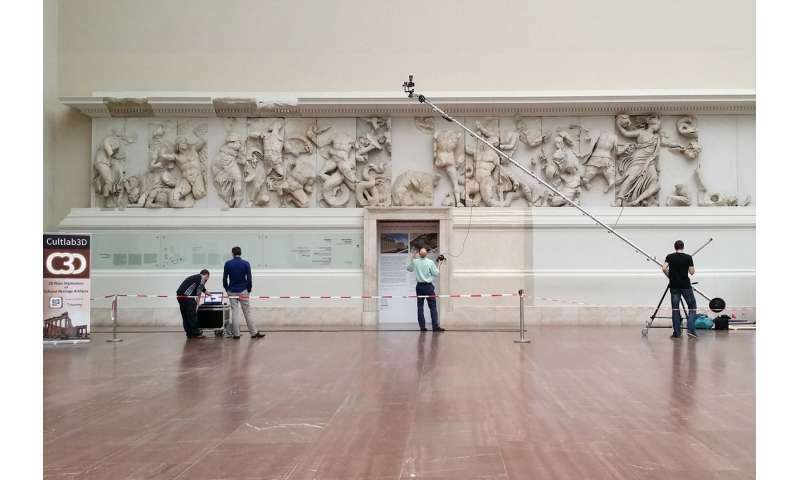 This is how the Fraunhofer IGD researchers digitized the Pergamon Altar – using a lightweight laser scanner. Now the research teams are taking it one step further: "In the future, we will not only depict the geometry, texture and optical material properties – in short, an object's exterior – but will also include its interior," says Constanze Fuhrmann, scientist and coordinator of the subproject "Sculptures: Novel damage and material analysis in 3-D" at Fraunhofer IGD. "The data on an object's interior and exterior, obtained using various technologies, will be uniformly combined to form a 3-D model that is then visualized in 3-D in space in front of the monitor." This first-time combination of digital Fraunhofer methods enables completely new damage and material analyses in 3-D (see box "3-D digital analysis of material and damage"). 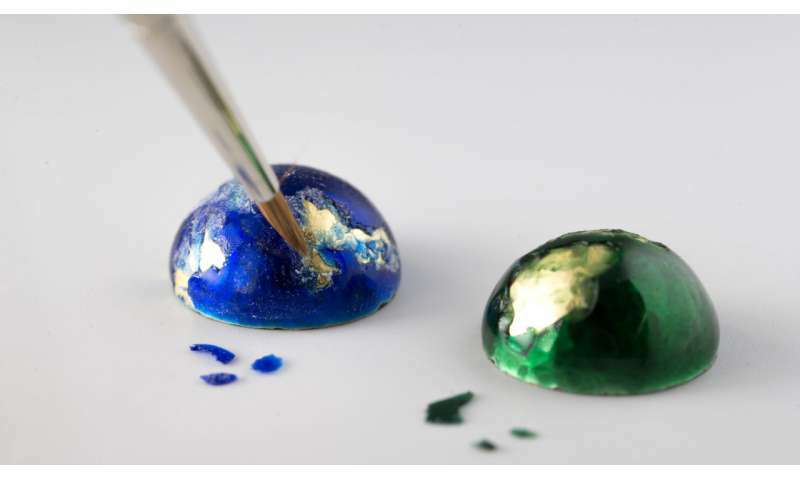 "We developed a suitable material for this at the Fraunhofer Institute for Silicate Research ISC in Würzburg twenty years ago: enamel ORMOCER ," explains Dr. Gerhard Schottner, who heads the department for glass research there. Besides its suitability for lasting conservation of enameled treasures, it can also permanently bond ivory and rock crystal, as was discovered in the restoration laboratory at the Dresden State Art Collections. Unfortunately, over the years, the raw materials supplied by industry sources became unavailable in the required quality, and even the slightest impurities can lead to differences in the synthesis of these silicon-organic compounds. So what now? "We need the best material for preserving cultural heritage, but the amounts required are fairly small," explains Schottner. This makes material development and sales unprofitable for business-oriented companies. The executive board project and funding from the German Federal Environmental Foundation offered a way out of this dilemma. The ISC team analyzed the raw materials and the individual steps in their production down to the last detail of the chemical reactions, including moisture and temperature levels, and examined the impact of the various solvents on the final product. Now the process is nearly complete: the material is in the final testing phase, and the restorer in charge, Rainer Richter from the Dresden State Art Collections, is extremely satisfied.